LEARNING JAPANESE IS EASY WITH A LITTLE HELP FROM MANGA UNIVERSITY! If you're a fan of manga and anime, you probably have had this thought at least once: "I wonder if I can learn Japanese?" And why wouldn't you? Japanese comics and cartoons are taking the world by storm, and you want to learn everything you can about the language and culture of the cool place they come from. So you pick up a textbook at your favorite store but quickly lose interest; while the book seems to be informative, it's certainly no fun compared with a good manga. So wouldn't it be great if there were a manga to teach you Japanese? Well, there is - it's called Kanji de Manga! Kanji de Manga is an award-winning Manga University series created to make learning how to read and write Japanese as fun and easy as picking up your favorite comic. We start you out with Kana de Manga, which uses cute and easy-to-understand manga illustrations to teach you hiragana and katakana, the "ABCs of Japanese." The book also introduces you to loads of helpful vocabulary, and there are plenty of workbook-style pages on which you can practice your new character repertoire. Learning Japanese through manga also means that you don't learn just words, characters and grammar. The illustrations and anecdotes in Kana de Manga will teach you all about Japanese culture, which is almost as essential to learning about Japan as the writing system itself! Once you've mastered kana, you're ready to take on the meat of the Japanese writing system: kanji. You might have heard that kanji are tough to learn, but with Kanji de Manga you'll learn new words and characters by reading fun and simple Japanese manga. That's right; after mastering the basics in Kana de Manga, you can start reading authentic manga written entirely in Japanese in Kanji de Manga! "A brilliant idea!" says retired UCLA Japan studies Professor Ronald A. Morse. "Japanese kanji — the written symbols adapted from Chinese — were originally drawings of images from real life. Japanese comic books and cartoons now provide fresh images to help us learn. 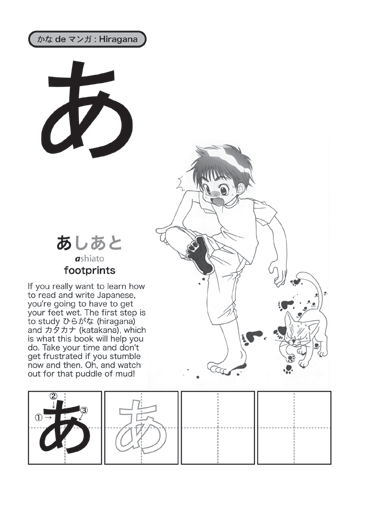 Kanji de Manga uses today's manga images to make the kanji learning process fun and easy for otaku of all ages. This is a brilliant approach to learning the language." Manga University has worked hard to craft both Kana de Manga and Kanji de Manga to teach you the same material you would learn in a traditional Japanese-language classroom. But we also know there's more to Japanese than what you can learn in class. That's where the Kana de Manga and Kanji de Manga Special Editions come into play. Featuring everything from sound effects to popular phrases and timeless proverbs, there's no limit to what you can learn from Kanji de Manga!